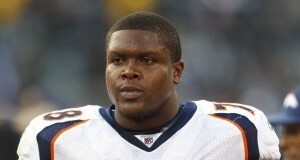 Longtime tackle Ryan Clady will be honored Sunday against the Chiefs. At approximately 3 p.m. MDT on Monday July 24, a collective sigh of relief was heard from the Mile High City. The question I have for everyone is: does the Broncos offensive line situation really matter as much as we're all reading into it? Understanding why the Broncos selected Bolles is important for fans hoping to move on from unsettled, borderline angry feelings. Loan repayment forces Broncos to make painful choice: QB or LT? Suddenly, that $20 million becomes roughly $16.5 million, before the Broncos sign their draft picks. Now, the Broncos may be left with some tough decisions. At the tackle position, the Broncos currently have Watson, Stephenson, Ty Sambrailo and the much maligned Michael Schofield. In order to assure that certain players remain in Denver, they had to use the franchise tag for the past three offseasons on Clady, Thomas and Miller. With success comes tough decisions, sometimes having to cut players, no matter how talented or important, due to salary cap or performance-based conclusions. It doesn’t look like the Broncos will be identifying any of their current free agents to be a franchise player, and that isn’t necessarily a bad thing.